This month’s challenge for the Michael’s Makers was to create something beautiful for Mother’s Day, whether it be a gift item, a tribute of some sort, or a piece of decor to create the perfect Mother’s Day setting. After brainstorming lots of different ideas, the team and I decided to come up with a topiary centerpiece that radiates as much beauty as Mom does! I have always loved hydrangeas for their full yet delicate blooms. They are soft and feminine and come in a variety of gorgeous colors, making them wonderful to incorporate into special event centerpieces. 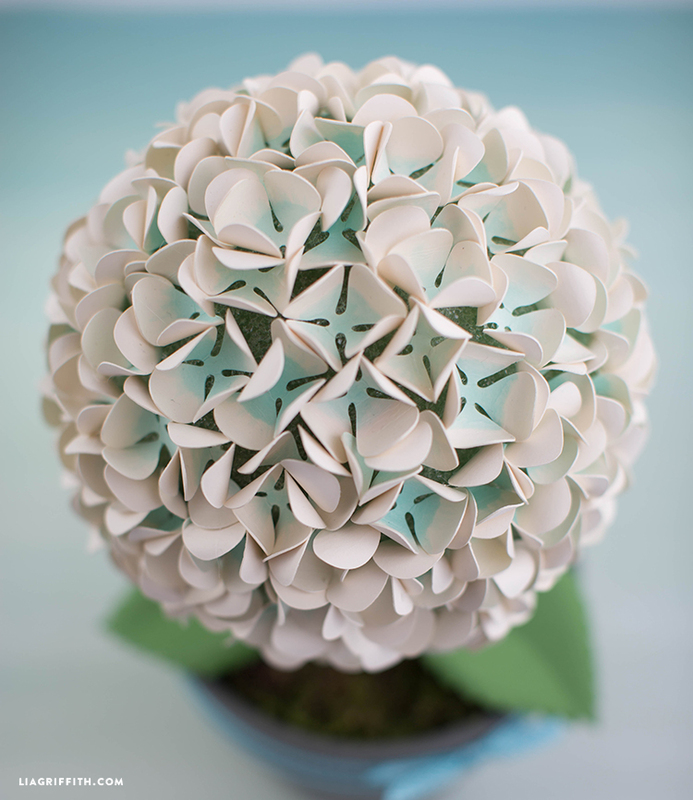 For our Mother’s Day hydrangea topiary centerpiece, we went with a white and light teal color scheme that is beautiful for the spring season. 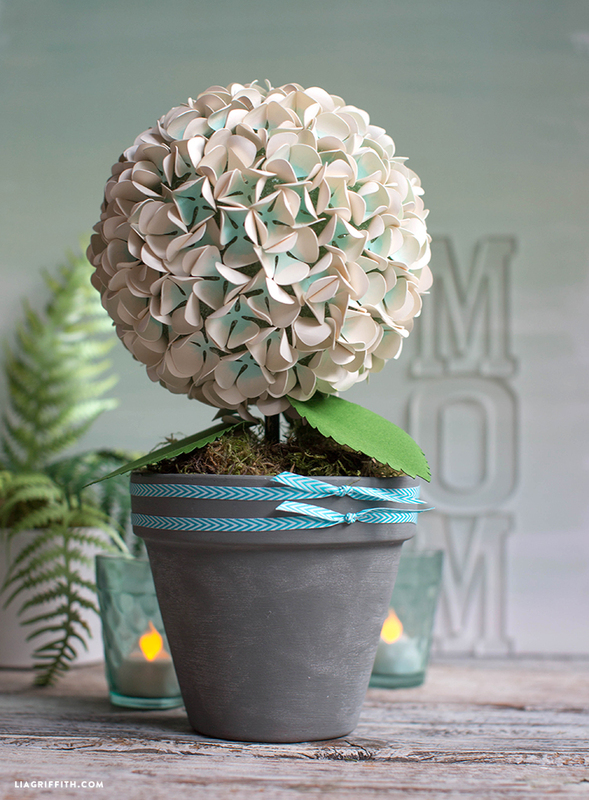 To make your own topiary centerpiece, you will need cream card stock, green card stock, plaster of paris, a wooden dowel, a foam ball, a terra cotta pot, and fake moss. I was able to pick up all of these goodies at Michaels! First, mix your plaster of paris in a disposable container. Before you pour the mixture into your terra cotta pot, make sure that you cover the hole at the bottom of the pot with some duct tape. Otherwise, your plaster mixture will just drain out of the hole! Once you pour your mixture into your pot, stick the dowel into the middle of the pot so that the plaster can dry around it. We painted our dowel with some green acrylic paint so that it would blend into the topiary, but this is totally optional. The plaster should take an hour or two to dry. While your plaster is drying, download the template below for the hydrangea petals and leaves. Use the SVG file if you are using a cutting machine, or the PDF if you are cutting by hand. Cut the petals and leaves out onto your card stock. To add the pops of light teal to our petals, we used a brush tip art marker and blender. Simply color the center of the petals with your pen (we used Copic brand) and then use your blender pen to soften the edges of the color. Use this technique with any color that you would like! To assemble your topiary centerpiece, stick a foam ball to the top of your dowel. Make absolutely sure that your plaster is dry before you do this! Choose whatever size of ball you would like for your specific topiary. 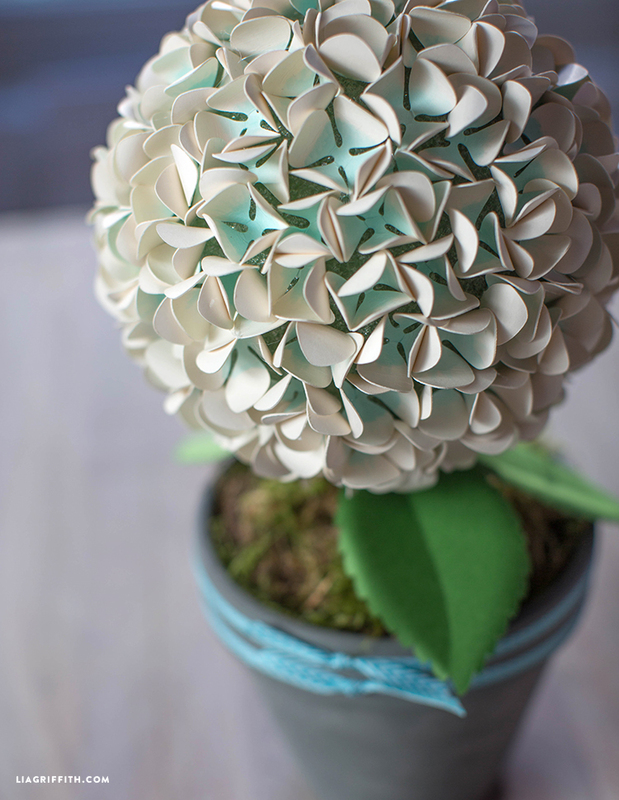 Then, use a hot glue gun to attach all of your petals to your ball. After your hydrangea is finished, use fake moss to cover the plastered area. 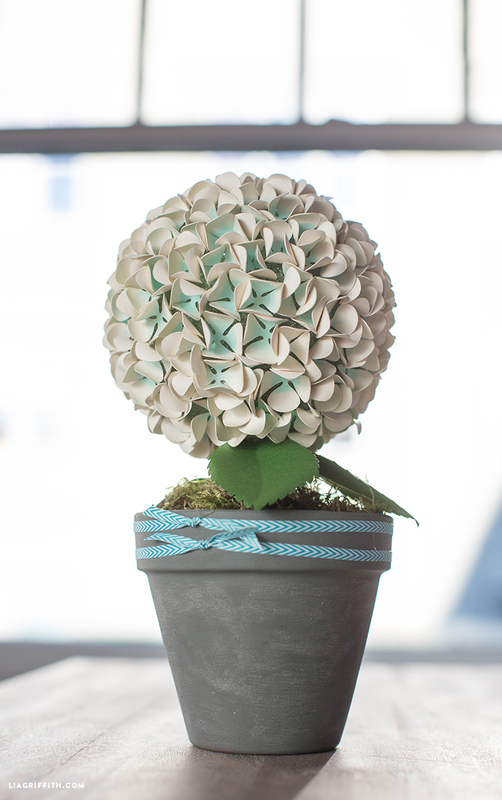 Glue your leaves to the bottom of your foam ball and your topiary is finished! To personalize the topiary, paint the terra cotta pot with acrylic paint in your mom’s favorite color (if you are painting the pot, you should do this before you begin the project). Or, add a pretty ribbon to finish off the topiary centerpiece. There are so many easy and fun ways to customize this project to make the perfect piece of decor to celebrate Mom!